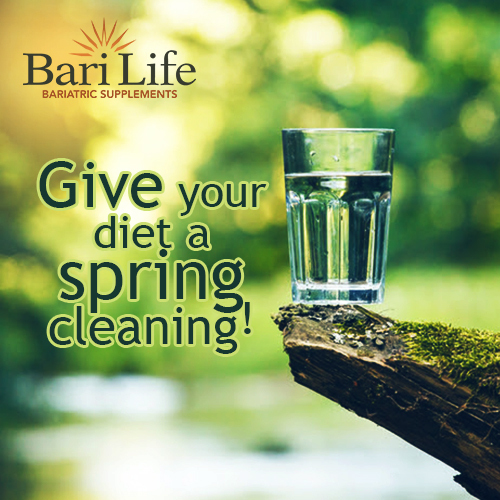 Bari Life Bariatric Vitamins and Supplements knows the importance of maintaining a healthy diet. Not only are bariatric vitamins important to your diet, ensuring you are eating the proper foods will help you achieve your weight loss goals and maintain your desired weight. During the cold winter months it’s easy to fall back to poor eating and fitness habits. Now that you’ve set your clocks forward, it’s time to rejuvenate, refresh and get back into the good habits you started before Old Man Winter came along and put a freeze on your healthy living world. Cut out sugar – When it’s cold outside, there’s nothing better than comfort food to warm your tummy. Cleaning up your diet starts with scouring your kitchen for items loaded with corn syrup, evaporated cane juice, dextrose, and other sugar impersonators in yogurt and even pasta sauces. Go natural – A 2011 Harvard study found that cooking food increases the amount of energy or calories that it provides to your body. If you want to absorb less calories, cut down on the cooked portion of your meals, and consume more raw foods. Choose color – Eating a rainbow of foods is a great way to load up on fiber, vitamins and other disease-fighting compounds. The more colors you eat, the better. Think scrambled eggs with spinach and red bell peppers, or strawberries and carrots with a fresh green salad. Drink your H2O – Drinking water helps you feel full, re-charges your body and can help speed up your metabolism. Eat in – Research shows people scarf down more calories and fat eating out. When you prepare your own meals, you ensure that you are getting the vitamins and nutrients needed to fuel your body without the added calories and fat.